Dress - Worked in one piece starting with yoke and working in back loop until commencement of skirt. Pattern Row - sl st to first ch1 space, ch4, 1dc in same space, work 1vst in each ch1 space to end, sl st to 3rd of ch4 on beginning of row. DNT. Continue in rounds without turning repeating Pattern Row until 18 rounds have been worked or work measures approx 11 inches from shoulder. Fasten off. Next Row - Join in color 2 with a sl st, * 1sc in each of next 2dc, (1sc, ch2, 1sc) in next dc, 1sc in each of next 2dc, sl st in next sc, * rpt from * to * to end. Ending with a sl st in first sl st on beginning of row (not a sc). Fasten off. Next Row - Join in color 2 to top of ch3, ch1, 1sc in base of ch1, 1sc in next dc, * (1sc, ch2, 1sc) in next dc, 1sc in each of next 2dc, sl st in next sc, 1sc in each of next 2dc, * rpt from * to * to 3dc and sc, (1sc, ch2, 1sc) in next dc, 1sc in each of next 2dc, sl st in last sc, sl st to first sc on beginning of row. Fasten off. Buttonhole Row - ch1, 1sc in base of ch1, * ch2, skip 1sc, 1sc in each of next 7sc, * rpt from * to * once, ch2, skip 1sc, 1sc in each of remaining sc. Turn. Next Row - ch1, 1sc in base of ch1, 1sc in each sc and ch2 space to end. Fasten off. Starting with ch1, 1sc in base of ch1, work 2 rows of 1sc in each sc to end, turn at the end of each row. Fasten off. Work in back loop of stitch only from now on. 2nd Row - ch1, 1sc in base of ch1, 1sc in each dc to end, sl st to first sc. Turn. Starting with ch3, work 1dc in each dc to end, sl st to top of ch3 on beginning of row. Turn. Work 1 row of 1sc in each dc, sl st to first sc on beginning of row. Fasten off. Join color 1 to cast on edge and starting with ch1, 1sc in base of ch1, work 1 row of 1sc in each ch to end, sl st to first sc on beginning of row. Fasten off. Row Six - (Dec) ch1, 1sc in base of ch1, 1sc in next 11dc, 1hdc in next dc, dec 1dc over next 2dc by pulling up loop from each of next 2dc, yo and pull though all loops, (5 times) 1hdc in next dc, 1sc in next 11dc, sl st to sc on beginning of row. Turn. Starting with ch1, 1sc in base of ch1, work 1sc in each sc to end, sl st to first sc on beginning of row. Turn. Row Ten - Join in color 2 to top of ch3, ch1, 1sc in base of ch1, 1sc in next dc, * (1sc, ch2, 1sc) in next dc, 1sc in each of next 2dc, sl st in next sc, 1sc in each of next 2dc, * rpt from * to * to 3dc and sc, (1sc, ch2, 1sc) in next dc, 1sc in each of next 2dc, sl st in last sc, sl st to first sc on beginning of row. Fasten off. Finishing - Weave in all ends and trim, attach buttons to correspond with buttonholes on dress. Flower Motifs - Made in rounds without turning. Large (make 2) With color 2 make magic circle, work 8sc in circle, pull loose thread to close circle, sl st to first sc on beginning of row. Third Row - ch1, (1sc, 3dc, 1sc) in base of ch1, skip 1dc, * (1sc, 3dc, 1sc) in next dc, skip 1dc, * rpt from * to * to end, sl st to first sc. Fasten off. (8 petal groups) Attach one flower motif to front of dress and one to the headband. Small (make 2 for decoration) With color 2 make magic circle, work 10sc in circle, pull loose thread to close circle, sl st to first sc on beginning of row. 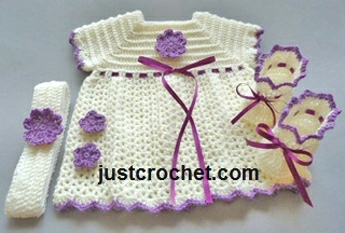 Hope you enjoy this free baby crochet pattern for a dress, headband and booties.